The ‘The cavalry is not coming: a guerrilla filmmaking odyssey’ course is geared for students who are interested in a more hands-on approach to filmmaking, but who are not 100% sure if this is the career path they want to choose. The course will give them a very brief overview of all aspects of putting a film together, from pre-production up to distribution. About the Presenter: Conroy Esterhuizen graduated from AFDA in 2005, majoring in film editing and is currently working as an in-house editor for e.tv, focussing mainly on the ‘South African Heroes’ documentary inserts. He has also just finished editing his first feature film: ‘Capitalist Pigs’ and is currently working on his second feature, ‘There is no place like Home’ which he wrote, directed, shot and edited. 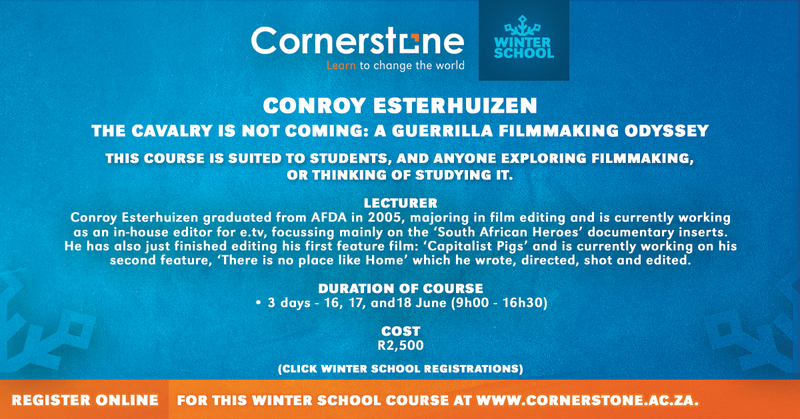 The course he is presenting is entitled; “The cavalry is not coming: a guerrilla filmmaking odyssey” which is suited to students, and anyone exploring filmmaking, or thinking of studying it.